These six chasers were among those that served in the minesweeping operations in the North Sea. 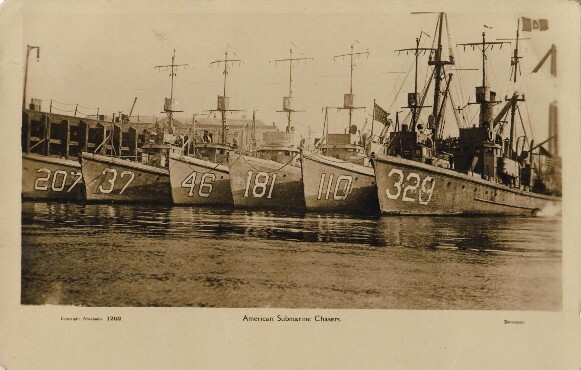 Photo postcard depicting SC 207, SC 37, SC 46, SC 181, SC 110 and SC 329 at Devonport. Thanks to Liz Phillips for sending in the scan. Another photo, from the book, The United States Navy in the World War (Russell & Moore, 1921), shows SC 37 under way, alongside SC 206 and a mine sweeper. Note: Google Books has a scan of this title online, but as of 07-2007, many of the pages are mis-scanned.